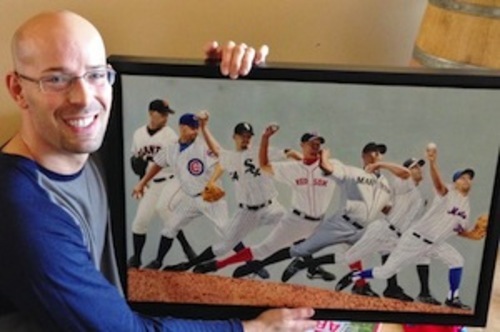 David Aardsma (Falmouth, 2002) holds an original oil painting that represents the seven MLB teams for which he pitched. The painting was commissioned by wife Andrea as a Christmas gift. Aardsma was among the Los Angeles Dodgers’ final cuts Saturday after a solid spring effort fell just short of earning him a big league job. Since being selected by the San Francisco Giants in the first round of the 2003 First-Year Player Draft, the former Rice University star has played for 23 teams in the major and minor leagues. In eight big league seasons with the Giants, Chicago Cubs and White Sox, Boston Red Sox, Seattle Mariners, New York Yankees (one appearance) and Mets, Aardsma has a career ERA of 4.23 ERA. “I guess I’ve been around, huh?” he said. A nonroster invitee to the big league camp this spring after signing a minor league contract with the Dodgers, he was reassigned to the minors Saturday as the Dodgers made their final cuts to get down to the 25-player limit for Opening Day. He was immediately added to the roster of the Oklahoma City Dodgers in the Triple-A Pacific Coast League. It’s an all-too-familiar situation for the former Falmouth Commodore, who failed to make the St. Louis Cardinals’ roster a year ago and was sent instead to Triple-A Memphis, where he posted a 1.29 ERA in 35 innings out of the bullpen, despite dealing with a nasty groin injury that cost him five weeks of playing time. Aardsma last pitched in the big leagues in 2013 with the New York Mets, compiling a 4.31 ERA and a 36-19 strikeout-to-walk ratio in 43 appearances after being called up in midseason from Triple-A Las Vegas. He hasn’t started a season with a major league team since 2010, when he was the Mariners’ closer. Aardsma was born in Denver and attended Colorado’s Cherry Creek High School, graduating in 2000. He subsequently enrolled at Penn State for his first year of college. In 2001, he transferred to Rice University, where he set school single-season and career records in saves in 2003, and he earned two wins and a save as the Owls won their first national championship in the 2003 College World Series. In the summer of 2002, Aardsma starred for Falmouth in the Cape Cod Baseball League, compiling an 0.68 ERA and 45 strikeouts in just 26 2/3 innings. He was enshrined in the Cape League Hall of Fame with the Class of 2010. Aardsma, wife Andrea, and young sons D.Z. and J.D. make their year-round home in Scottsdale, Ariz.